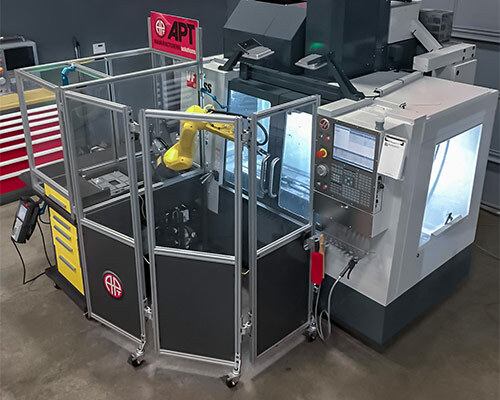 The APT MTEC is designed to showcase real world applications of robot tended CNC machinery designed to take away the mundane load/unload tasks of an operator in a normal machine shop CNC. It has been designed to easily integrate to small to medium sized CNC machinery. The teaching of the robot is the pick and place locations and the air blow off path. All communication input/output is pre-configured and ready for integration to the CNC machine using M codes in the CNC program. 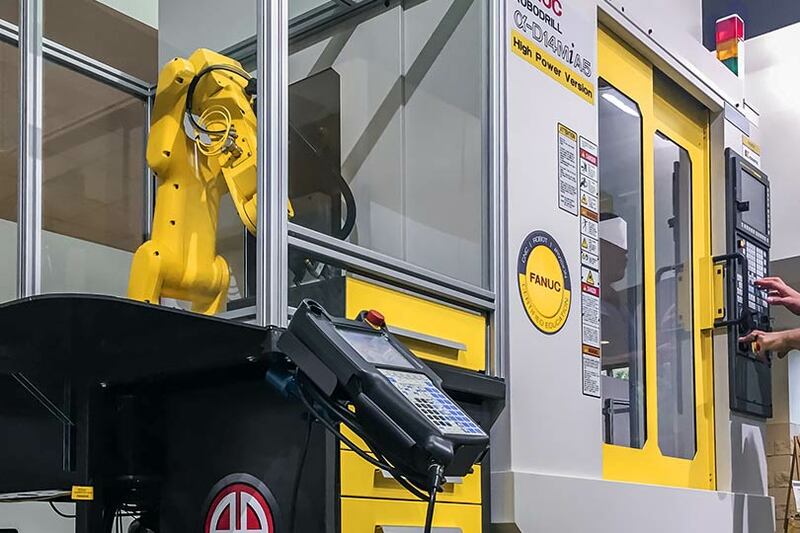 Note that the CNC machine may require upgrades for the communication to the robot. 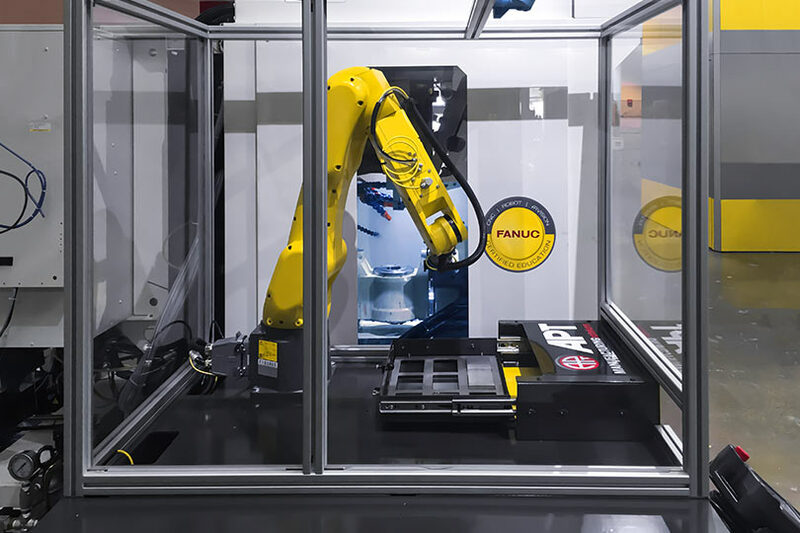 The “Safe Load” parts drawer is designed to keep hands away from the robot motion area while in use by the robot. The drawer being used by the robot is locked from the cell operator. This drawer cannot be opened without requesting the robot return the drawer. Part blank location is done with a template-based part locator. The system above includes a template sized to fit the drawer with cut outs for the standard NIMS mill block and included aluminum parts blanks. The template is made from 12 ga 304 stainless steel for low profile part locating and long life. New templates are easy to machine the appropriate part locating shapes into for future project-based machining operations. The robot is set up for the template by row count, column count, row pitch, and column pitch. 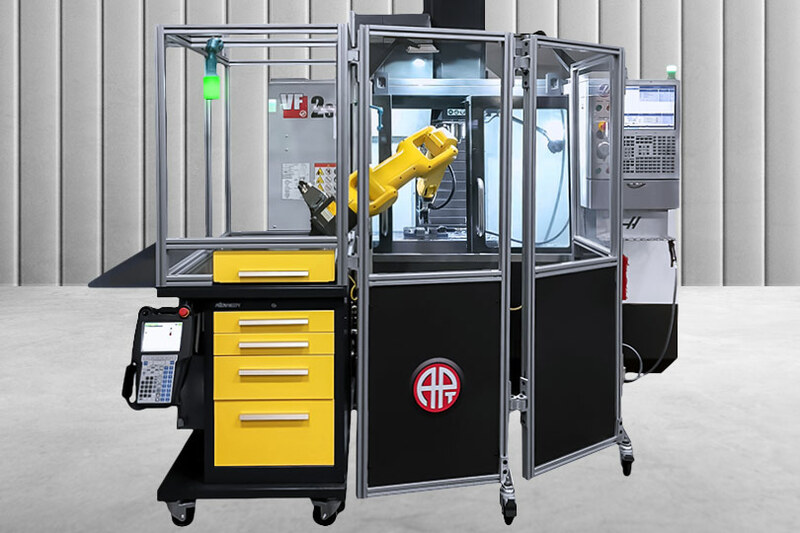 The first pick and place point is the only position that the robot needs taught, all other positions are driven from the row and column count and pitch in a standard grid type pattern. Dimensional drawing is also provided of the template blank for creating more custom templates as the end user sees fit. 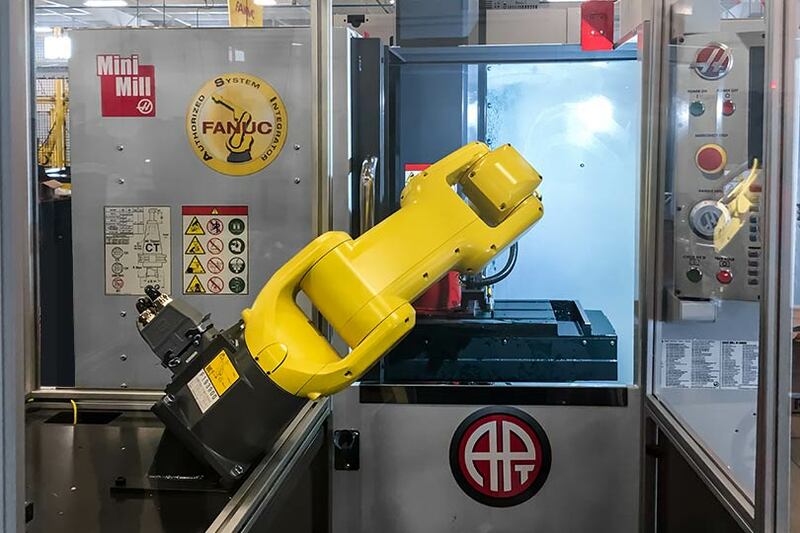 Students familiar with CNC or robots have the opportunity to learn real world advanced automation integration. Tri-fold guarding or area scanner for front load of CNC. Preloaded with load and unload program templates for simple build with no complex programming needed. Front or side load machine. Fits through standard door and includes four side pickup and transport. Optional iRVision 2D for error proofing and guidance. Optional built-in Kennedy toolbox for convenience.